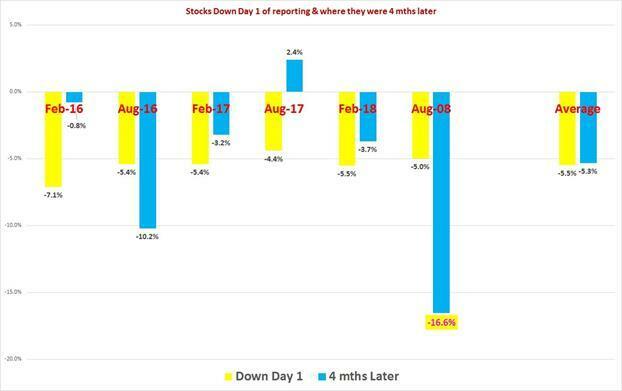 Reviewing the data for the last six reporting Seasons, I consider here how stocks that were either up or down on the day of reporting subsequently traded over the following four months. The results are very clear. 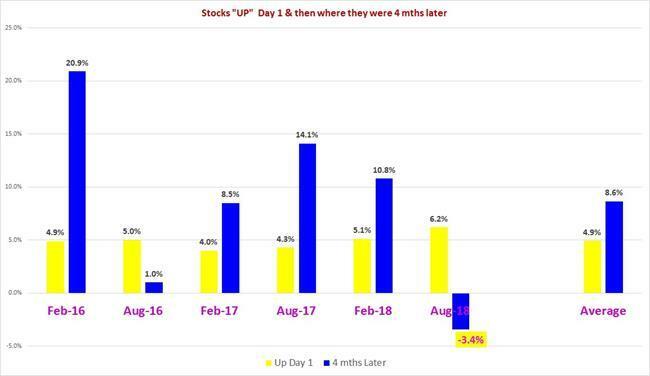 Looking at stocks that were up & down on the day they reported, I have noticed over the years (and now have the hard evidence from the last 6 reporting seasons) that how the majority of stocks move on Day 1 generally determines where it will be 4 mths later.. Overall though the rise +4.9% Day 1 extended to be up +8.6% 4 mths later. 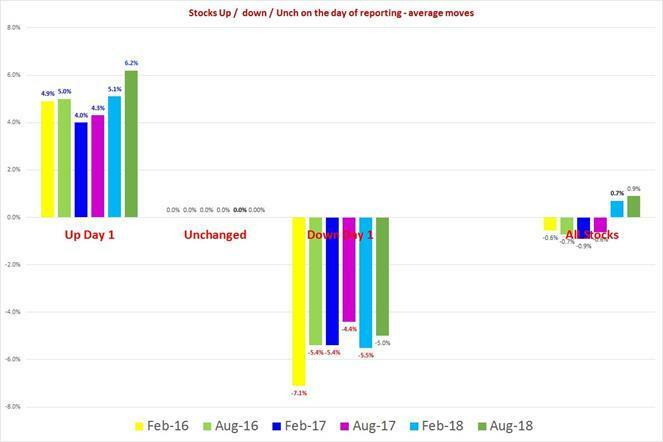 So in 5 out of the last 6 RS, being long these stocks up on Day 1 tends to be a good strategy, if you own before hold - but if not then you buy on the day they report. So if you can’t decide to buy & you wait a few days or weeks – you may be paying more later on. In 5 of the 6, these stocks were still down, but had improved a little bit from where they were on the day they reported.. So many get smacked day 1 & then continue lower, but over time some bargain buyers come in & lift them. So the move 4 mths later is a lot better than where they were in the weeks & month after they reported. On average these stocks that were down -5.5% on Day 1 were still down -5.3% 4 mths later. So in some ways its tells us there are "bargain buyers" who will go after some of these & buy on the weakness. This article is based on excerpts from The Coppo Report contributed to Livewire by Richard Coppleson, Director - Institutional Sales and Trading, Bell Potter. You can find out more by clicking here. You can also stay up to date with the latest news from me by hitting the 'follow' button below and you'll be notified every time I post a wire. Wouldn't it be better to compare the moves to the market as a whole? That would eliminate the market bias in the following 4 months, which of course was pretty negative in the case of Aug 2018. That would certainly help me judge the consistency of the effect you are trying to demonstrate, rather than having the market noise confuse the issue.